For many golfers, the ability to address the ball correctly diminishes with age, injury and tiredness unless specifically addressed through proper conditioning. For example, we need to create straight not hunched posture. The reason; a straight back rotates more, creates more torque and therefore more power [this is one of the things we work on in my swing analysis and postural assessment for example]. Sitting at a desk, driving long distances, doing crunches and sit-ups, riding a bike indeed many things contribute to us not being able to do this. This creates a loss of power. When we swing we need full rotation and yet must not lose sight of the ball. This means possessing sufficient shoulder and neck mobility. Such mobility, however, is not common in most amateur golfers. When we lose such mobility, we end up with shoulder impingements and injury or inconsistent ball strike. When it comes to ball strike we need maximal acceleration at impact, we must avoid a reverse pivot and maintain the correct joint angles through the swing to ensure a straight trajectory. Of course, taking lessons from a golf pro can help massively. However, you can’t buy flexibility, core stability or good joint mobility from the pro shop. Following are some exercises that have helped me in the past to address specific areas in my swing, they are simple and they do work! With all these exercises: focus on a start point in your abdomen at your belly button and feel as though you are pulling it towards your spine-’engaging your core’. 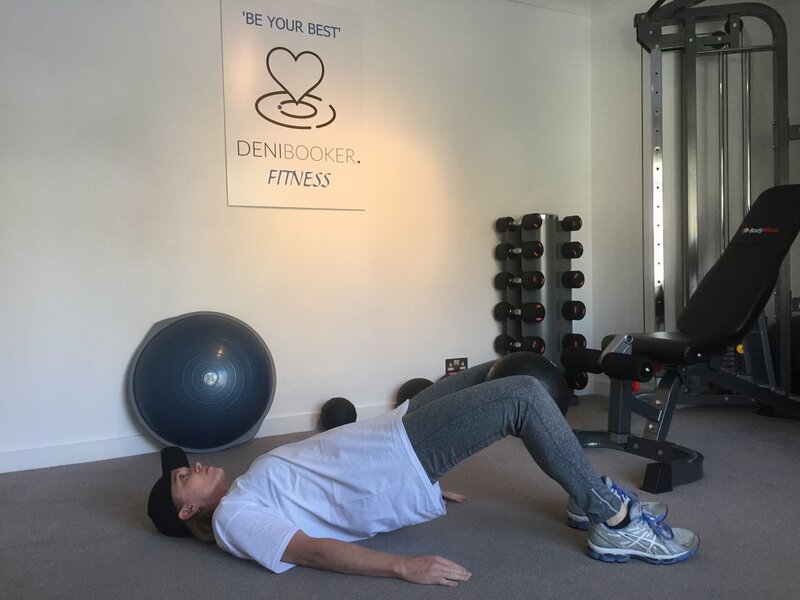 Still breath normally but feel your ‘core’ engage when doing these exercises, it will help achieve results and do them correctly. Exercises for correct set-up for the golf shot! Stand upright with legs hip-width apart, bend one knee and kneel onto the floor with this knee so that there is about a 90-degree angle in the leg that is bent, place a hand on the leading knee, exhale and lean forward focusing on pushing the front of the hip of the back leg towards the floor. Hold for 15-30 seconds x 2. Repeat on the other side. 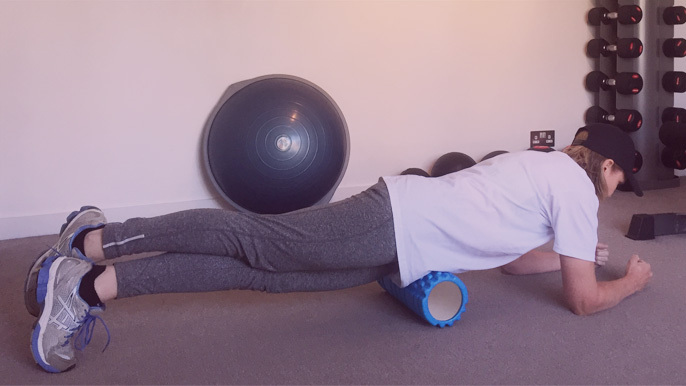 Lay face down with a foam roller under the front of on hip and the other leg to one side. Use forearms to help support weight, keeping abdominal muscles engaged and place as much weight on the foam roller as tolerated. Roll along the front of the upper thigh to the hip. Then repeat on the other side. For a more intense massage, cross the other leg over the back of the leg being massaged to increase pressure. Full Bridges are not suitable for beginners and the instruction for below is for a Short Bridge, which is the most common starting point. Lie on your back with hands by your side, knees bent and feet flat on the floor(under the knees). Press feet into the floor as you tighten your bottom and abdominals-squeezing a towel/ball between the knees, lifting hips up to create a straight line from knees to shoulders. 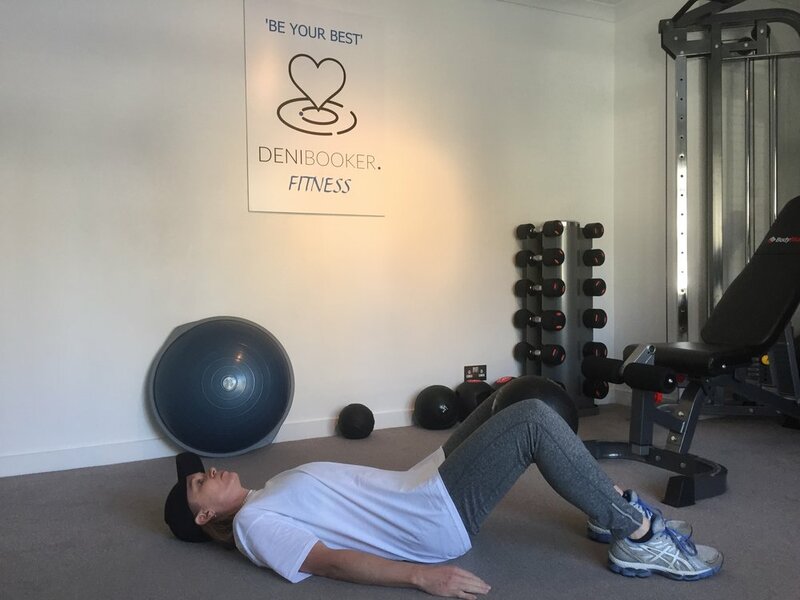 Hold position in good form (tense the core) aiming for 15-30 seconds, then lower back down. Note: If hips begin to sag or drop, lower back down to the floor. Hip flexors are highly activated on the downswing and are responsible for maintaining good posture, they generate power and stabilise the body, if they are weak this can lead to loss of spinal posture and angles and poor consistency. The gluteus, hamstrings and core are also important in stabilising the body for good setup and good alignment through the swing and providing power for the transfer within the swing. These are key areas to reducing back injuries. Begin on your hands and knees on a mat. Hands directly under shoulders and legs are hip-width apart with knees directly under hips. Curl toes under if more comfortable. Engage your abdominal muscles. Align the spine so there’s a straight line from your ear to hip. Inhale – Then, on the exhale, pull your abdominal muscles in and up as you arch your back up like a stretching cat. At the same time, let your head and tail bone drop down toward the floor. Now, move to the cow pose, inhale and reverse the curve of the spine. The tail bone moves up and your chest moves forward and up. Neck is a long extension of your spine. Don't let the head fall back. Be sure to support this move with your abdominals. This is a lengthening move for the spine. Please don't collapse! Position your hands directly below your shoulders and your knees below your hips. Simultaneously extend your right arm forward and your left leg backward until they are parallel to the floor. Hold for a count of three. Bring the leg back to the original position on the mat but take the right hand underneath your body pointing past the left knee, rotating the shoulder towards the mat briefly. Extend your arm and leg again and repeat 10 times. Perform the exercise with your opposite arm and leg. Feel like you are holding a glass of water on your back-slow and with good form is key, not speed. In between these 2 moves you should after time also find the neutral position of the spine - not too arched, neither to rounded. This position with engaged core will build up the strength and increase mobility of the spine, also help rotation of the torso, shoulder and neck, thus increasing torque and power in the swing to hit it further and more accurately, as will the below 3 exercises. Assume plank the position on both hands. The aim is to lift the hand off the floor without rotating. To make easier spread the feet wider apart. Before raising the hand, brace the core and slowly row hand to the side, lower back down and repeat the other side. To make more difficult introduce dumbbells to lift. Remember to keep still, just raise the limb. Although it is an anti-rotation exercise it will actually strengthen the muscles that drive rotation in the swing. Do 2 sets of 4-6 rows each side. Stand upright facing an open doorway. 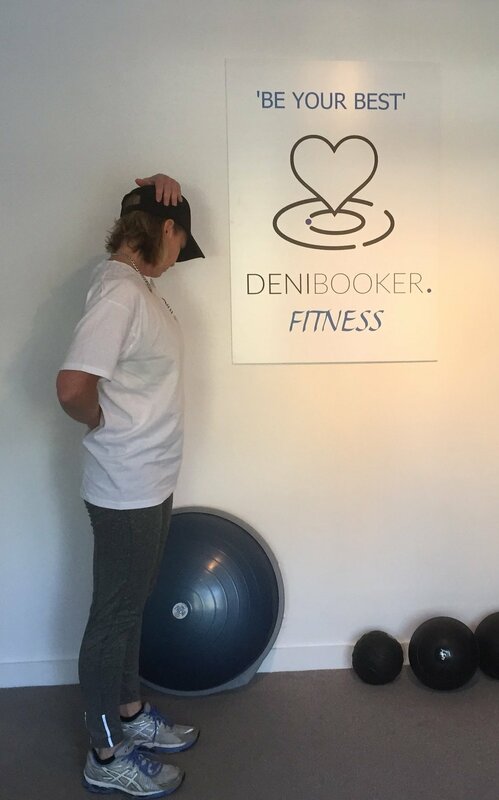 Raise the elbows to shoulder height at your sides, bend the elbows so that the forearms point straight up, and place the palms against the walls for support and then exhale as leaning forward with your entire body. Hold for about 15-30 seconds x 2. Place left the arm behind the back. Tilt right ear to right shoulder, use right hand on the head to increase the stretch. Will feel this along the side of your neck. Spine and shoulder mobility is key to complete rotation in the swing, this will create power throughout the swing to hit it further, these exercises will also prevent injury and move more freely, enabling the golfer to play with reduced restriction and pain should they have problems in these areas. Good all round exercise for pelvis and knee stability to promote good weight transference in the swing. Take a step or box and stand parallel to the side, then using the leg closest to the step, raise leg and step sideways onto the box, using this leg to raise up and then back down, trying not use the leg on the ground too much. Use controlled and slow movement for both directions, being careful for the knee not to collapse inwards, feeling a real burn to the gluteus suggests correct technique. Repeat the other side. The nature of the exercise and lateral move is reflected in the golf swing and will provide good stability and weight transference vital for powerful and long shots. Start with a short club like a Wedge, take the stance with both feet together or an inch or 2 apart. Hit several shots at half speed until gaining good contact and maintaining balance.  Speed swing up to 75 percent, focusing on balance and tempo. Continue drill gradually increasing length of club up to driver. This drill is very easy to do anywhere, at home in the garden without a ball, it will help ingrain fundamentals like balance rhythm and timing. Most golfers hit it too hard, slide their hips or try to ‘lift’ the ball up into the air. This simple drill can help to combat these issues. 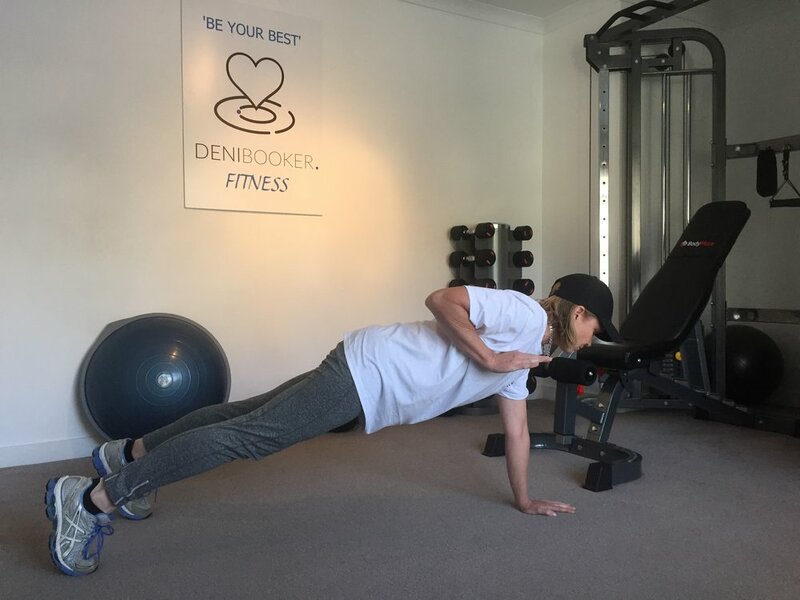 As a former Tour Player and event winner, Paramedic and Fitness coach I understand what it takes to win, how debilitating various health conditions can be, but also how to fix them and, of course, just how important fitness is to play great golf.